Welcome back everyone! 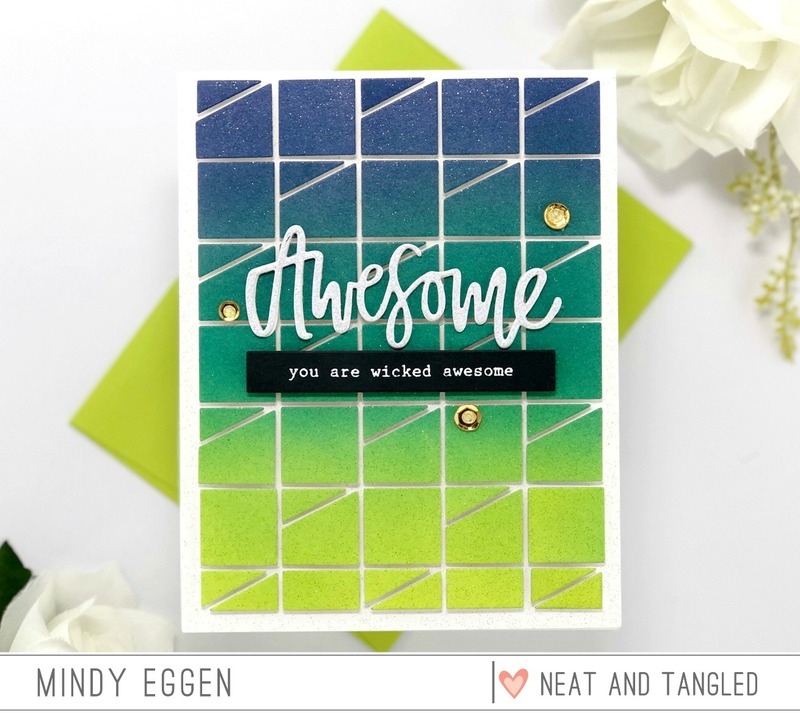 Mindy here with you today to share a wicked awesome card! For the most part, this card was pretty simple. I took a piece of Bristol Smooth card stock and ink blended Chipped Sapphire, Pine Needles and Twisted Citron Distress Oxide ink. I die cut this piece using the Receding Blocks Cover Plate and my Gemini Jr. Since my pieces pretty much stayed in place when I took it from the machine I decided to add foam squares behind each piece. Yes. Very tedious but I think it was totally worth it! Once I had the backing of the foam squares removed, I placed a 4 1/4″ x 5 1/2″ piece of Neenah Solar White card stock over the top and pressed down. This attached all of my foam to the card stock. I was then able to peel back the frame and I was left with this amazing design with dimension! I couldn’t stop there. I sprayed my panel with Thermoweb Gold Glitter Dust to get all that sparkle! 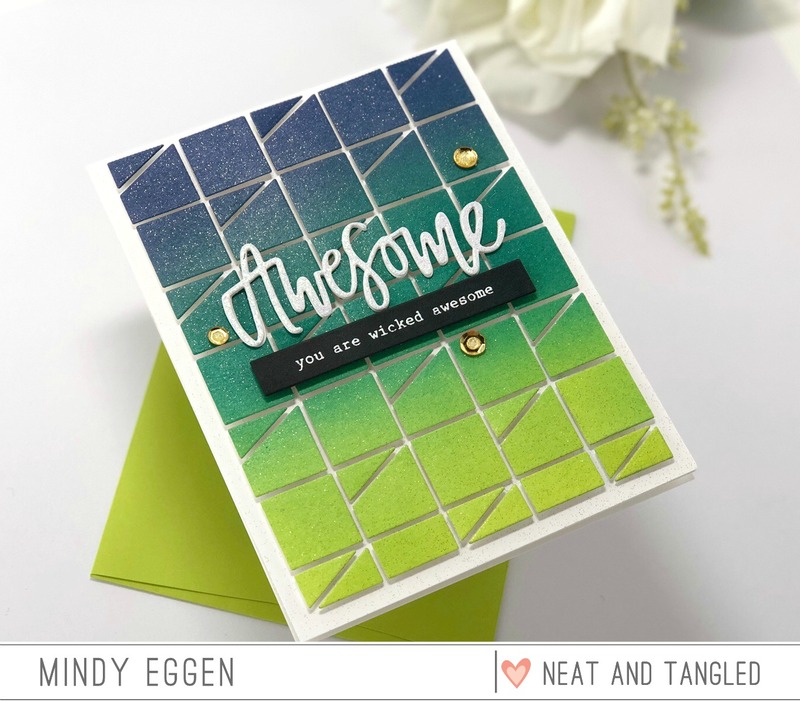 I’m totally in love with the new Typed Sentiments stamp set. This one matched perfectly with the Awesome Word Die that I cut from White Glitter card stock. I also cut the word die two more times from white cardstock and layered together with liquid glue. To create the sentiment, I first matched up which Skinny Strip would fit best with the sentiment. Then, I die cut the Skinny Strip from Black card stock. To stamp the sentiment, I attached Repositionable Adhesive to the back and lined up in my Misti tool. This makes it super easy to stamp and my card stock won’t move. I prepped my strip with anti static powder tool, stamped in Clear Ink and heat embossed with White Embossing Powder. I then attached the sentiment to the card front with foam tape. I finished off the card by attaching some sequins from the Peacock Feathers Mix with liquid glue and then filling the center with Unicorn Stickles. This would make a great masculine card ! It’s perfect to give to my hubby who’s been shoveling us out of all of this snow lately. Ranger Ink New Products Unboxing! 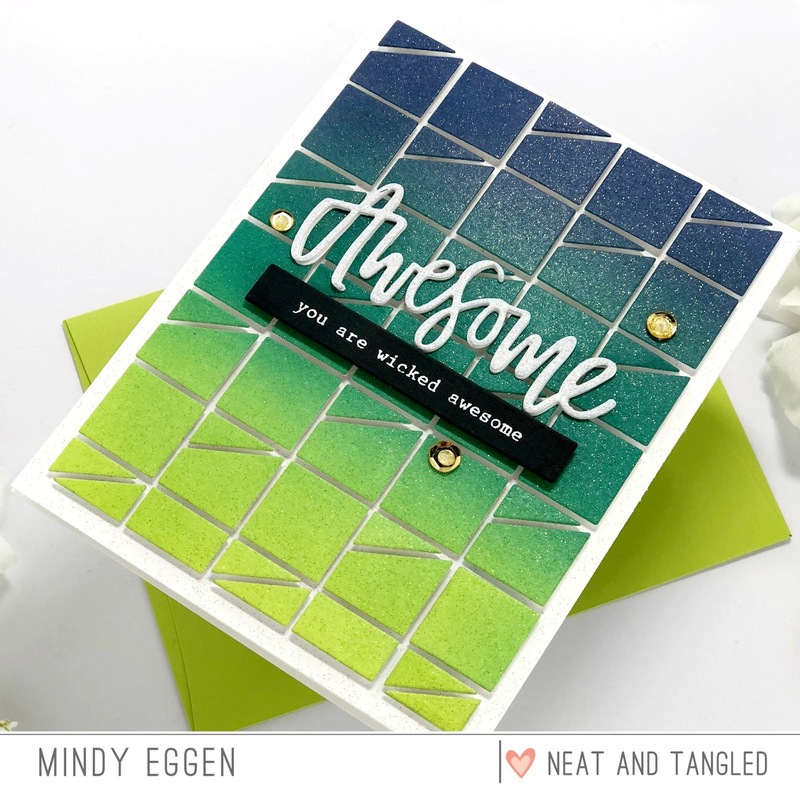 Wicked cool card! Loving those colors too!